So what does grief look like after 2 years? It is a full moon tonight as I contemplate this question. Everyone grieves differently. For me, grief is a different creature than it was last year, or even the year before. For me, it lurks deep in the crevasses of my emotions, boiling in the depths far below the view of the outsider, or even – at times – myself. Yet at the right moment it bubbles up like a volcano, racking my body with sobs, an emotional sink hole in an otherwise softly curvy road in life’s journey. A week ago yesterday marked the second anniversary of Keith’s passing. The actual day of the anniversary, Sunday, September 1, 2014, passed with little fanfare, a relief that the day was finally here and soon to be gone. 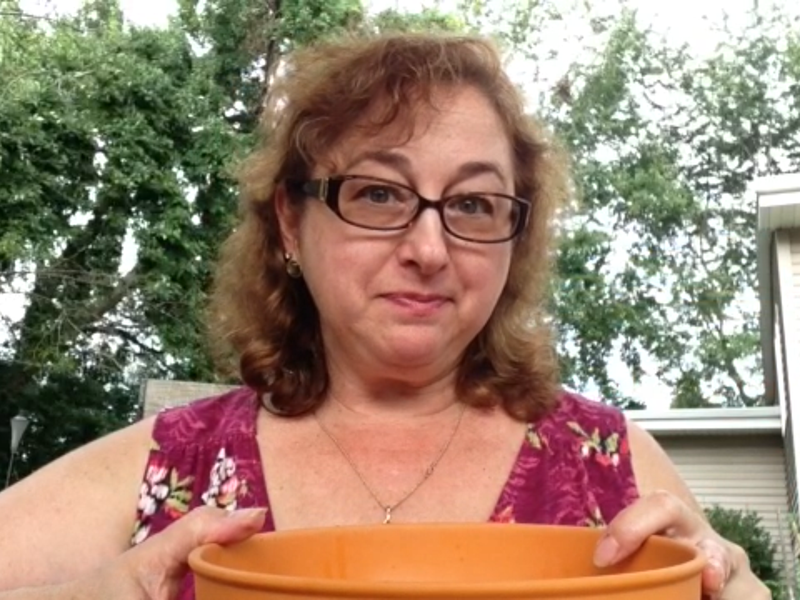 I took part in the “Ice Bucket Challenge” where I wrote two checks – one for Keith’s scholarship, and one for the American Cancer Society – and then prepared a Tequila Sunrise to toast in Keith’s memory, followed by dumping the bowl of ice over my head, all recorded for sharing on FaceBook, as is the custom for this challenge. It was a cathartic ending to a difficult, yet sometimes fulfilling, week. For me, it was the anticipation of the anniversary date, brought on by the pattern of activities that occur annually at this time of year, that made it more difficult to maintain an even emotional keel during the week before. And some changes in my work made this passage even more pronounced. This summer I was offered a new opportunity at the college, to serve as Faculty Director for the Center for Teaching and Learning where I could test out my newly minted doctoral studies in community college leadership. The opportunity marked the end of my reign as Program Coordinator in Graphic Design, a program I created upon my arrival from Fiji back in 1997 and had guided to success ever since. To step down from that position, while still maintaining my teaching position (and teaching just one class) was a major shift both mentally and emotionally. It meant turning over the reigns to one who I had helped mentor to take over. But I never thought I would see such an opportunity so soon. I was truly excited by this new endeavor. But it also meant stepping further away from a life and identity I had built with Keith. That is part of the crux of this. It is all about Time, with a capital “T.” Time, in this case, is like a long winding road that sometimes loops around on itself. My life with Keith now lies further back on this road. And each new step I take building a new life takes me further and further away from him and the journey we shared together. As sad as that sounds, the reality is that he is not here, physically at least, traveling on this road with me now, and I’ve come to terms with that. There are others who are on this journey with me, my children who still connect me to Keith. Many dear friends and extended family members. And then there is one especially sweet and gentle hillbilly of an artist who has joined me on this road I travel now. It is all about Time, with a capital “T.” Time, in this case, is like a long winding road that sometimes loops around on itself. On the college calendar, all faculty come back from summer for Welcome Back week. The last two weeks before classes start are among the busiest for everyone on campus, but especially in the office of my new job. Yet so marked are these late summer dates in my mind, that I can’t help but count them down. Friday before Welcome Back week… when the hospice nurse urged me to try and go to my doctoral class meeting in Grand Rapids after we had spent the morning talking about installing a hospital bed in our bedroom so that Keith would no longer have to climb the stairs. Keith had expressed his concern to the hospice nurse about being too much of a burden on me while I attempted to go back to teaching in Fall. For me, it was an admission of my failure, that the end was near for Keith, that I could not save him. It broke me emotionally and I cried all the way to Grand Rapids and back, even screaming at the top of my lungs in the cocoon of my car. Then there was the following Wednesday afternoon when I attempted to try and pretend I was doing something normal by going to the Faculty picnic. I lasted only an hour, leaving after the VP told me that she didn’t expect me to be there, to go home to be with Keith. She was right. I couldn’t face all the happy people excitedly telling stories of their summer adventures. This year’s Welcome Back festivities brought all those memories back to me again, especially that picnic. But this time, I mostly enjoyed seeing all the smiling faces. It was a good day. A mother-daughter bonding day, a day when we didn’t need to spend lots of money to enjoy each other’s company. My younger daughter and I got together on Sunday, the day before the 2nd anniversary. It was a good day. A mother-daughter bonding day, a day when we didn’t need to spend lots of money to enjoy each other’s company. We enjoyed looking in antique shops, eating a cheap but delicious BeBimBop at Cosmos, and wandering Ann Arbor chatting away about everything and anything. I know that when Keith died, she was worried about losing her mother, too, as I made my own way through grief. Her older sister had her new husband to lean on. My younger daughter’s concern seemed to grew when I met my new friend Steven. It has been a long winding road, but a certain balance has begun to evolve. I am seeing the way forward to build a new life with a new partner and new job, balanced with the life that existed before and which provides the foundation for my future, and the evolving dreams. But it’s not without tears. That winding road of Time, when the events flip back over upon themselves, repeating their position on the calendar, mock my grief which had sunk deep out of sight into those crevasses. Then, occasionally, it explodes as it did this year in a sobbing release. It occurred this time on that Wednesday before the semester started, the same day as that faculty picnic. I had tried to remain stoic and put on a happy face throughout the week, and most of the time I actually felt happy! The new job was starting and I was immersing myself in learning as much as I could about its operations and mission. But I could feel the cracks occasionally fissuring away at my strength. Steven was trying to help. He had arranged to get my car serviced a week before at his son’s shop in Gladwin. And now he was even getting new tires put on after we discovered the cause of a slow leak in one of the tires, a metal screw that probably came from the roofers at Perry Road. In discussing the cost of the tires, I had pulled out the papers from nearly two years ago in October 2012 when I’d brought the car to a company Keith had used before to get two new tires. Back then, the kids had been concerned saying my rear tires were far too worn to be safe and urged me to go. It was just 5 weeks after Keith’s passing and I went to the tire place thinking it should be a straightforward affair. It was… as long as I didn’t pay attention to the charges. Looking at the receipt now nearly two years later, Steve and I discovered I had been charged for two overlapping warranties amounting to nearly $140 in extra charges. On this night, after getting the exact same tires put on for nearly $230 less, Steven was angry at the original tire company that he believed had taken advantage of me. Extending the conversation, he was equally impatient that the roofers had not taken better care to clean up the nails and debris from their installation at Perry Road. Yet another item seemed to irritate him that wasn’t done more carefully at Perry Road, too, and he expressed a frustration that some people may have taken advantage of my more vulnerable position. But the reality was that back then… during those six months after Keith’s passing, I did not have the strength to push for details. I just wanted things done. And if it caused too much of a drain on my energy to try and resolve an issue, I backed off. I had learned that life was, indeed, too short to waste one’s energy on arguing. And the reality was also that, as a woman, I was indeed taken advantage of by certain vendors, especially the tire company. It’s a common theme experienced by many women. Even more than that, though, was the fact that Keith had been my protector, running interference and taking care of those things to his satisfaction while allowing me to focus on other things that helped make our lives run smoothly, things that I was more expert in. He would take care of the car and tires. He would have made sure that the roof, or the drain tile, or the clean-up was done satisfactorily. Steven, though well intentioned in expressing his dissatisfaction over these issues, feeling they were an affront to my wellbeing, had succeeded in reminding me how vulnerable I had been without Keith. It reminded me how much Keith had protected and cared for me in these situations… and, yes, how Keith had protected me from at least one unscrupulous “friend.” Steve’s frustration reminded me how far away from Keith that time’s winding road had carried me, only to flip around and hit a moment of painful memories… And then the dam finally broke on the wall of tears that I’d held back for the previous week. A gentle embrace held me while I sobbed until I had no more tears left. And then life went onward and the grief receded to the deep crevasses again. Life is good. Life is blessed. Next month I should be defending my dissertation, another milestone on the winding road of this ethereal journey of dreams. 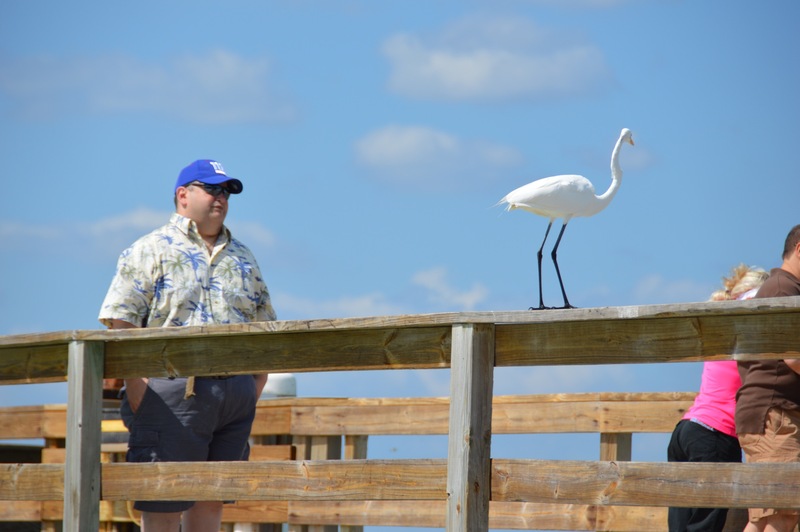 Above: My brother is met by a White Heron who hung around on the beach near Sarasota, Florida during our visit in May 2014. 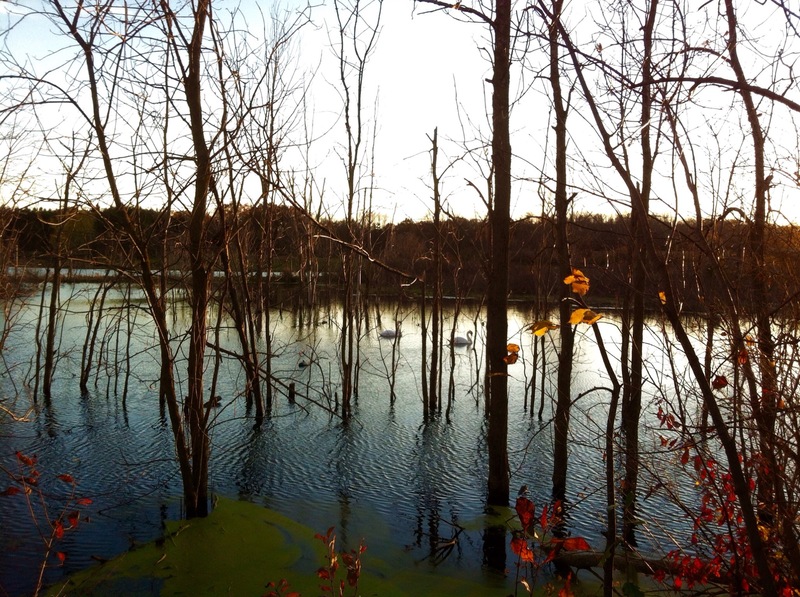 I have often thought that the Heron, whether White or Blue, was Keith’s animus. 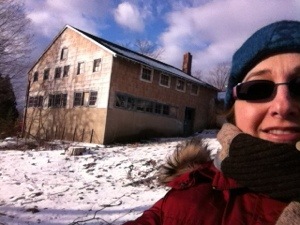 Perry Road workshop after a spontaneous sleigh ride down the hill, a week ago. The sun was quickly melting a new fallen snow. It was fortuitous that the workmen would come today (Friday, 3/1/13), the six-month anniversary of Keith’s passing. 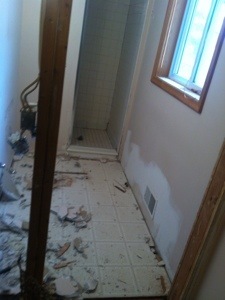 They moved up their starting day to remodel the master bathroom at home. The room had been a running joke in our lives, but also a sore spot Keith would ignore in favor of taking on other projects, commitments, or just going for a ride on the motorcycles. I admit that I enabled this. I much preferred to ignore it myself and go have fun, then to fight over it= and cause unrest in the house. Yet there it was, in all it’s ugliness, the focus of which was the freezing shower with the cracked tiles, the shower door falling off its hinges, the moldy ceilings, etc. When I had packed up many of Keith’s things, I came across a drawing and notes he had made for remodeling this room. My own drawings were not too far off. The difference was the custom cabinet which I could not supply. And so other solutions would be needed. In the end, though, I was forced to make a last minute change, bumping the wall out into the bedroom about a foot so that the cabinet I ordered wouldn’t block the doorway. This was the part Keith would have customized, creating a slant to ease the entry while still allowing for the larger cabinet. But mine was 20 inches deep, and the wall next to the door was only 16. I could not put it tucked into the corner as planned. And I couldn’t move it over due to the toilet space needed. So the wall would be moved. I listened as the guys smashed and cut away old fixtures and floors, while I worked on a paper in the cozy little cocoon I made of my bedroom behind plastic sheeting hanging from the ceiling. It was exciting to start this project. Nearly 16 years after moving to Michigan, and about 15 years after moving into this house, that bathroom was always the target of my disgust. Cracked tiles, continuously moldy grout, shivering cold, a tiny vanity, all added up to a room that I just wanted to smash. It became a running joke (and point of terror) that when the kids misbehaved, they’d be threatened with scrubbing the shower tile in mom and dad’s bathroom. So when the guys showed up this morning and started the demolition, I asked them to give me a chance to smash something, just one thing to get out my frustration. I took aim at the soap dish, broken for the last three years where the mold had seeped into the crack and degraded the already cracked and ugly ceramic dish now hanging jagged out of the wall. SMACK!! and crash, I swung the hammer at it with my eyes closed tight, the guys behind me cackling at the sound of the pieces hitting the tile floor of the shower. I was anything but satisfied. I was angry. Angry that it took 15 years and the death of my husband to get to this point. Angry that I was doing this on the 6 month anniversary of his passing. Angry at Keith for abandoning me. Angry at myself for feeling guilty about wanting the embrace of another man in Keith’s absence. Just plain angry at the world. I handed the hammer back to Joe who shook his head still laughing at my overly dramatic swing, and so I managed to summon a smile in return. My last big assignment for a doctoral course was calling me. So I slipped through the plastic sheathing that hung between the work area and the rest of my bedroom, climbed back onto my bed where my iPad and reading sat waiting for my attention. The countdown weighs heavily on my heart, 55 minutes, 54, 53, 52, 51… Keith died at 7:55 pm on September 1st, exactly 6 months earlier. Just a few days ago, visible in the pre-storm night sky, the nearly full moon loomed overhead, stars sparkling and taunting me in a bittersweet reminder of the date to come. But tonight, this last hour has been painful. The other part of the remodel project ws to replace the vanity in the kids bathroom. Keith had made it and painted it with analine dyes a scene of seaweed and deep blue waters. Unfortunately, he hadn’t accounted for the doorframe trim and the kids were never able to pull the drawers out as far as intended on one side. I feared that any new owner of this house would simply pull the cabinet out and toss it. So I ordered an inexpensive white cabinet the same size and had the guys swap it out. It’s 7:45 pm. 10 minutes before that moment when we knew Keith made his last breath… 6 months ago. Stassia is busy texting me about how much money she’s losing from her free trip to Florida. I try and restrain my impatience and simply remind her that it will all work out, I had planned to help her out anyway, knowing there would be some impact on her missing work. She has already been stressed due to a cutback of hours so I try not to feed her anxieties. I have enough of my own. Four minutes now. I’m beginning to feel a little better. Time is passing quickly and I focus on the passage of this sad milestone which will put me on the other side of the hump between the first half of a year after he died, and the second half when looking forward should become more common than looking back. I moved a photo I have of Keith that sat on my side of the bed. It was the one where he has that silly smirk on his face. But more often recently, that smirk has looked more like disapproval, and even hurt. I couldn’t face it any longer, at least not every moment when I sat on my side of the bed we used to share. I moved it over to “his” former side, the side where I keep my powder puff from crabtree and evelyn, and my button jar, the side where I moved my flickering lamp when I swapped it for his working lamp. It’s 7:55 pm now. My heart sinks a bit. I have already shed some tears in exasperation. But the moment has passed. It’s time to move forward. I love you Keith. I will always love you. But I cannot live with the pain of your loss. I must live with the hope for a new future. Otherwise, my grief will consume me, a feeling I have occasionally faced in a depressive moment, ready to give up on going forward. Yes, the moment has passed, an inauspicious milestone. Six months to the minute since Keith died. I breathed deeply and tried to go back to my work, knowing I am not alone on this road. And that there are angels – or ghosts – who watch over me, too. My dreams, and those of a good friend, make that clear. And oddly enough, more recently, I am also thankful that, even if it does not grow into anything further (or I refuse to let it), there’s a little guy up north who is willing to talk to me, listens to my tears, and even then still calls me cutie, and offers me a virtual hug. We have never met, but I have grown more fond of him. Maybe it’s because at this point it is still fantasy. But, at the moment, I can live with that. And the demolition begins, at home on Jerome Lane. I signed up for Social Dancing and took my first class on Wednesday. The kids encouraged me, too, saying it would get me out of the house. And besides, I needed the exercise. Yoga has been part of my routine every other day. But it’s nice to mix it up. So I was both excited and a little nervous about this new “mini” adventure. It went very well. I found myself really enjoying myself. So it surprised me a little when the silver-haired instructor (probably around 70 yrs old) came up to me as I was getting my coat and asked if I was okay, was I crying? Oh, no, I’m just fine. But the kids say I wear my emotions on my face too clearly these days. So maybe Beverly, the masters ballroom dance champion, saw what I felt inside but hadn’t acknowledged yet. My dance partner, a nice gentleman slim and well over 6 feet tall, almost had to lean to reach my shoulder of my 5’2″ frame. And rather than look up and crane my neck, I just stared ahead at the button on his shirt. Then, quite often, I would just close my eyes and count as I concentrated on where to put my feet. In the space of an hour, we learned the Fox Trot, Waltz, Rumba and a few steps of East Coast Swing. It went by quickly and I found the steps easy to learn. I had an urge to push the dance further with the other moves I knew went with them. Feeling the beat, I channeled a little of the great Tamara Doriva, my grandmother, bell of Spanish Harlem, who made her fame as a folksinger/dancer, a femme fatale on the stages of NYC in the 1930s and 40s. As I closed my eyes, I could easily forget where I was. Instead, I was transported back to a time not that long ago, when my dance partner was my dear Keith as we shared our utter joy at our daughter’s wedding. It has been less than 19 months since that joyful dance, when we saw the future as newlyweds ourselves, with children grown and still young and energetic enough to enjoy the next chapter with youthful-minded (if not youthful physically) abandon. After my dance class, once I got home from picking up a few items, the kids were all there for a visit and I got to make dinner for more than just me. Laughter and bawdy humor filled the house, jokes flying here and there like old times. It felt good. Later that night, I sat on the bed and looked at Keith’s photo, touched my lips with my finger and pressed it on his, turned the light off and cried myself to sleep. 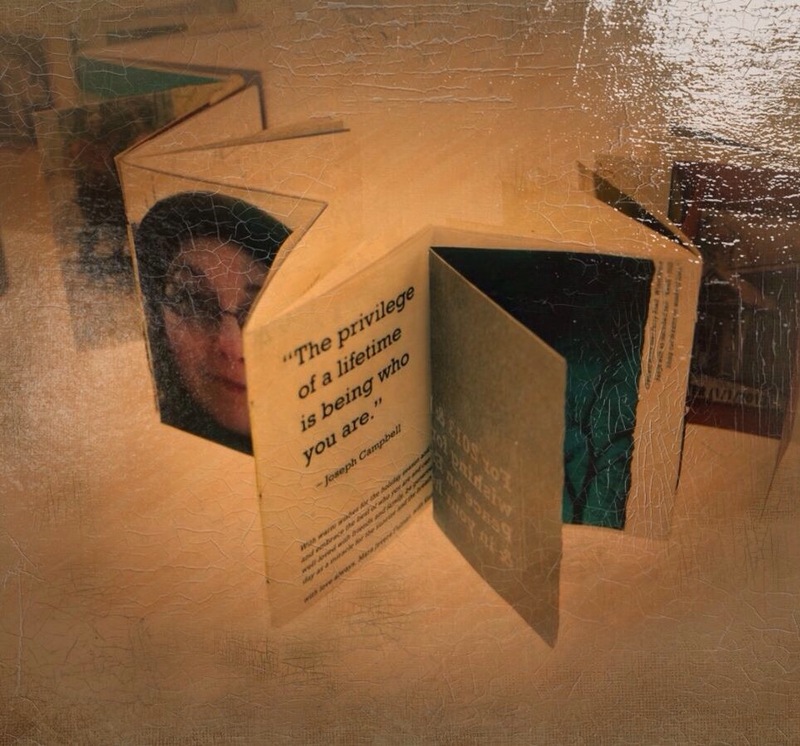 I’ve done three book arts workshops in three weekends and now won’t have another until March when I go back and revisit letterpress printing. Each trip to Ann Arbor for the workshop is usually followed by a visit with Stassia, wandering around the used bookstores, maybe a little peek in the Ten Thousand Villages shop, of course after looking around the gallery where Stassia works. While this activity has been very therapeutic, I’ve also found myself suffering waves of emotion that were entirely unanticipated, especially after I’ve had long periods of feeling fairly good. It became clear to me that it was time to revisit a grief counselor and so I arranged to set up semi-regular visits to a therapist who could guide me through this next phase. As strong as I may think I am sometimes, my very smart grown children have said “it’s okay” to ask for help. I think that for me, it is comforting just to have this touchstone meeting to look forward to, where I can let some of the emotional backlog slip over the dam. In early January, I thought I’d turn over a new leaf. Mostly I think it was loneliness and lack of adult conversation. But I decided to check out one of the online dating sites for “older” adults. My profile clearly states that I am not interested in marriage or longterm commitments at this time. And I boldly express how I do not wish to be “saved” and hold very liberal views. 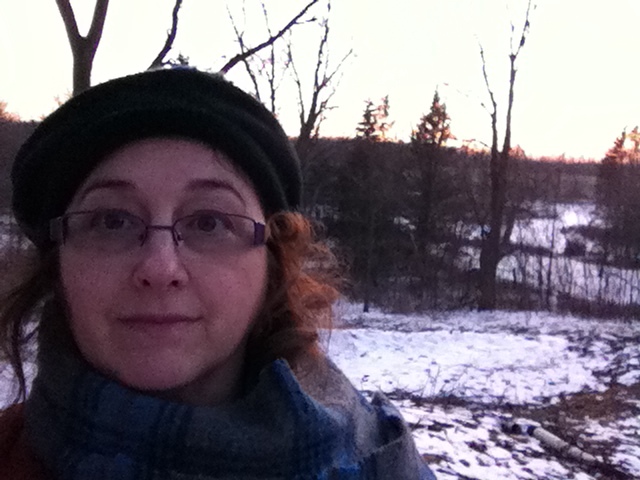 I describe myself as an artist, educator, and writer, and a recent widow. So in spite of my frankness, it is amusing to see what the results are from this experiment. Stassia has been a great source of advice and between us we often share anecdotes over who has messaged us recently. A very odd mother-daughter bonding experience has resulted, even if no other of my online conversations have led to anything beyond an occasional entertaining message. In spite of all that, I have had some nice message exchanges with some educated intelligent people, including the occasional teacher. And, as my daughter has indicated, it’s nice to have that validation that I may still be attractive to others, in spite of my “curviness”. So I guess it will take a lot more time to work out the landscape of widowhood and all that it means to travel this road.